Entering is easy. Simply enter your name and email address in the box below, and check back on Friday, December 26 to see if you've won. It's that simple! This giveaway is open to US residents only. Giveaway runs until Thursday, December 25 at 11:55pm EST. One entry per person, email address and IP address. Multiple entries will be disqualified. Great giveaway! I was looking at this for myself while Christmas shopping - but resisted. well, merry christmas to us...great giveaway! Would like this for a friend. This is so awsome!! I love it!! My favorite brand! 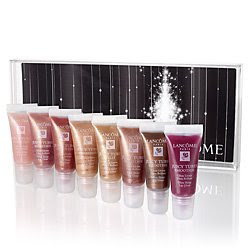 Lancome MAKE SUCH QUALITY PRODUCTS! THANKS FOR A JUICY GIVEAWAY! I love lipgloss and I didn't do any Christmas shopping this year so this would be a great gift for myself.